The Alberni Valley Bulldogs are back in action tonight as they host the Cowichan Valley Capitals for their only game of the weekend. 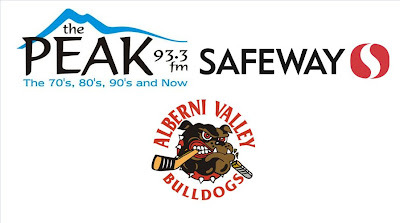 Catch the pregame show on Port Alberni Safeway Bulldogs Hockey on 93.3 The Peak FM at 6:45pm with the puck drop at 7:00. Tonight's second intermission feature guest will be Joe Scali, a Bulldog from the 2003-2004 to 2005-2006 seasons. Joe now plays with the Cornell Big Red in the NCAA. Here's another short and sweet update on the Midget Bulldogs in Kamloops. Thanks again Russell. The Midget Bulldogs are now 2 - 0 having defeated Peninsula Eagles 11 - 1. Edward Dyson faced 24 shots and game MVP Sheldon Trees scored 4 goals. The team is using the Olympic ice to its advantage with exceptional passing and speed. We'll see you at the Pound tonight! Way to go Sheldon Trees Congratulations on 4 goals.